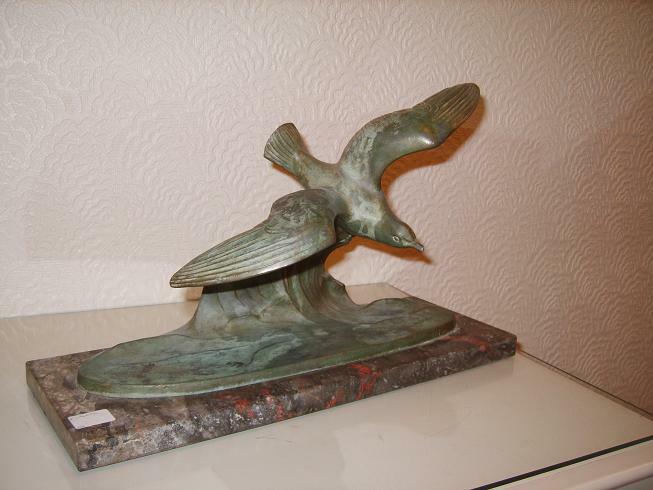 A Bronzed patinated spelter figure, c. 1890′s of a sea bird, possibly a Sea Gull flying low through the waves. The figure stands on a nice marble stand and looks very nice. It is sculptured by a known French sculptor “Maurice Font” and is thought to have been made around the late 19th century. It has a very small chip on the front left hand corner of the marble stand and this is reflected in the asking price. (click on picture for larger image) Please see payment options. Price: £135.00p, includes p&p, for mainland U.K. only.